CES 2018: LG unveils world's first 65-inch UHD Rollable OLED TV. 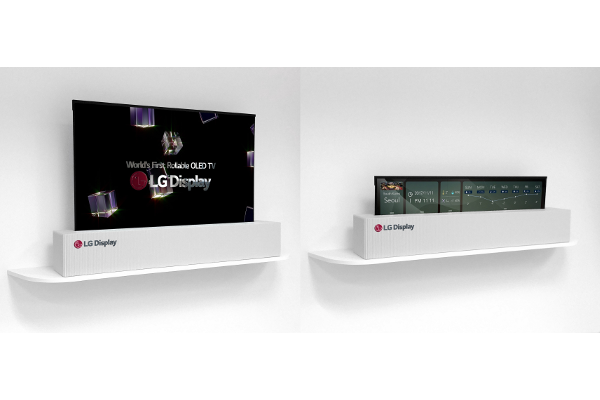 LG Display today showcased cutting-edge display products including the world's first 65-inch UHD rollable OLED display at CES 2018 in Las Vegas. The newly-unveiled 65-inch rollable UHD OLED display especially highlights the distinctive technological edges and unlimited potential of OLEDs. It can be rolled up and hidden when not in use, and the small size of the rolled-up screen means that it can be more easily moved and stored, allowing for better space utilization, something existing displays can't deliver. With this unparalleled portability, the 65-inch rollable display ensures that users can enjoy bright, high-resolution content anytime, anywhere.